nodes = findNodes(mesh,'region',RegionType,RegionID) returns the IDs of the mesh nodes that belong to the specified geometric region. nodes = findNodes(mesh,'box',xlim,ylim) returns the IDs of the mesh nodes within a bounding box specified by xlim and ylim. Use this syntax for 2-D meshes. 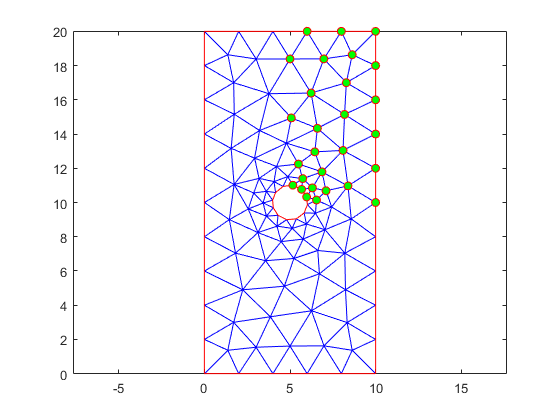 nodes = findNodes(mesh,'box',xlim,ylim,zlim) returns the IDs of the mesh nodes located within a bounding box specified by xlim, ylim, and zlim. Use this syntax for 3-D meshes. nodes = findNodes(mesh,'radius',center,radius) returns the IDs of mesh nodes located within a circle (for 2-D meshes) or sphere (for 3-D meshes) specified by center and radius. nodes = findNodes(mesh,'nearest',point) returns the IDs of mesh nodes closest to a query point or multiple query points with Cartesian coordinates specified by point. Find the nodes associated with a geometric region. Find the nodes associated with face 2. 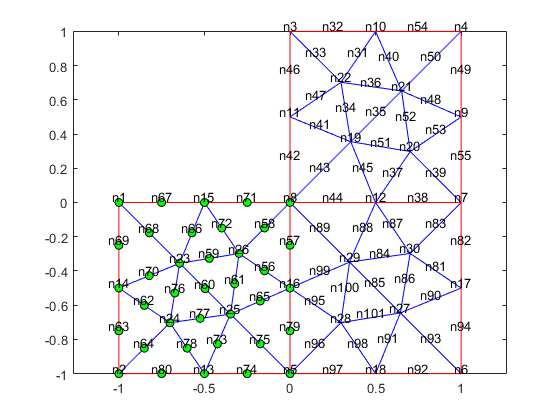 Highlight these nodes in green on the mesh plot. Find the nodes associated with edges 5 and 7. 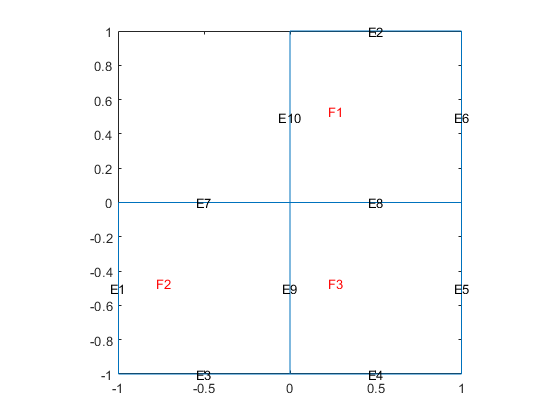 Find the nodes located within a specified box. Import and plot the geometry. Find the nodes located within the following box. Find the nodes located within a specified disk. 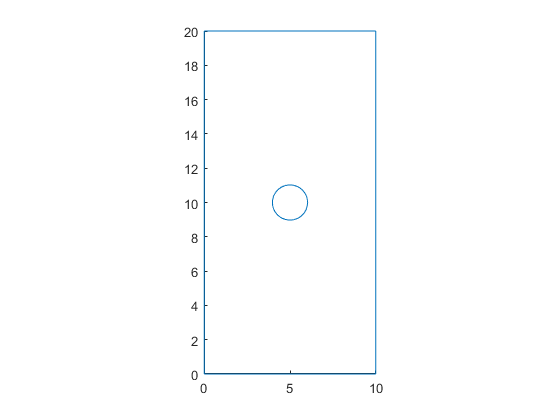 Find the nodes located within radius 2 from the center [5 10]. 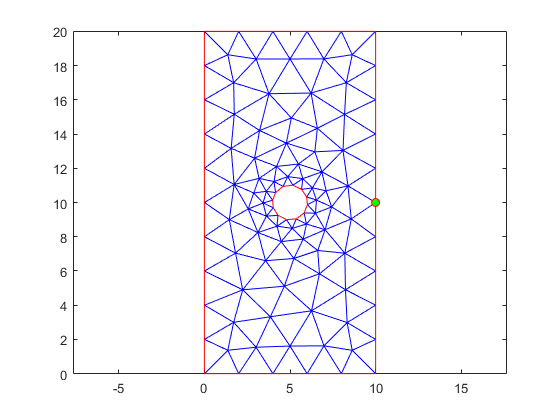 Find the node closest to a specified point and highlight it on the mesh plot. Find the node closest to the point [15;10]. 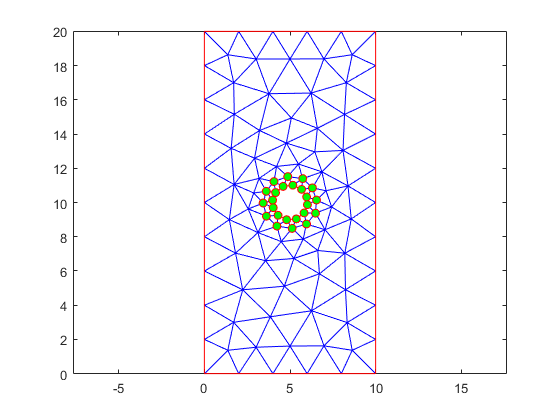 Highlight this node in green on the mesh plot. Geometric region type, specified as 'Cell', 'Face', 'Edge', or 'Vertex'. x-limits of the bounding box, specified as a two-element row vector. The first element of xlim is the lower x-bound, and the second element is the upper x-bound. y-limits of the bounding box, specified as a two-element row vector. The first element of ylim is the lower y-bound, and the second element is the upper y-bound. z-limits of the bounding box, specified as a two-element row vector. The first element of zlim is the lower z-bound, and the second element is the upper z-bound. You can specify zlim only for 3-D meshes. Center of the bounding circle or sphere, specified as a two-element row vector for a 2-D mesh or three-element row vector for a 3-D mesh. The elements of these vectors contain the coordinates of the center of a circle or a sphere. Radius of the bounding circle or sphere, specified as a positive number. Cartesian coordinates of query points, specified as a 2-by-N or 3-by-N matrix. These matrices contain the coordinates of the query points. Here, N is the number of query points. Node IDs, returned as a positive integer or a row vector of positive integers.